I spent most of last Saturday dragging my two-and-a-half-year-old daughter around a lake or two up in Rocky Mountain National Park. We were hiking and throwing rocks in the water, and I was secretly trying to get her interested in fishing. I even brought a Tenkara rod for her to try and cast. Laugh if you must, but I swear to you she can actually sorta cast the thing. It’s perfect for her to learn on as there’s no line to manage and no reel to mess with. On the way into the “Park,” as we like to call it, we stopped at Kirk’s Fly shop to get my wife a fishing license. I was perusing the aisles when it hit me: kids would probably be a whole lot more interested in fishing if they could actually see the fish. I asked the sales clerk if they sold kids’ polarized glasses. He looked at me with a sideways glance and said “Of course….” I have to admit I didn’t even know they existed. 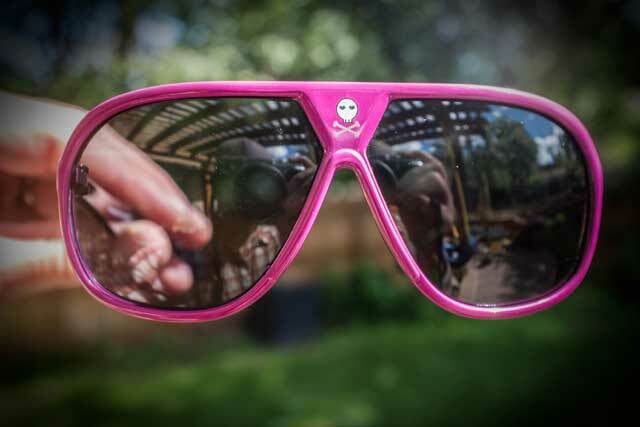 I let my daughter Mabel pick which pair, which was of course were the pink pair with skull and crossbones on them. She’s got excellent taste. Now these aren’t your Smith Optics or Costa variety sunglasses, but while the quality wasn’t exceptional it really wasn’t that bad. For $17 I figured what the heck, I’d give em a try. It was a wise decision. She loved ’em before we even hit the water. She was twisting and turning her head to make “the sky more BLUUU” and loved taking the glare off the water and seeing everything down below. After she realized she could see some of the trout I was seeing, all she wanted to do was find more fish. That doesn’t mean she was fishing for them, but at least she was interested. And that’s good enough for me. So if you’re struggling to figure out how to get your kiddo interested in fishing, do yourself a favor a spend a little dough and get them some polarized lenses. You might just be pleasantly surprised.